Image of a lone female figure walking away from viewer in a landscape of rows of barracks with Heart Mountain looming in the background. She has silver hair and yellow-beige skin. 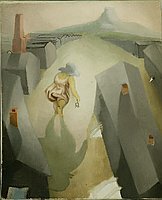 Dressed in a sleeveless pink dress and gray hat, the woman walks barefoot between two large barracks in foreground in the early dawn indicated by the pale rose and lemony glow of the sky. She appears to be holding a set of keys in her proper right hand. Her shadow, a large green misshapen version of her body, looms behind her in left foreground. The road is flanked by dark gray barracks lined up in regimented rows, some with terra cotta colored chimneys, and recedes into the distance toward the base of the flat-topped mountain. Her sight appears to be fixated on the grayish-green shape of Heart Mountain. The artist uses a palette of softly muted colors -- primarily pale salmon pink, olive and khaki greens, maize yellow and gray tinged with lavender. The scene has an early morning yellow glow. The composition of the painting is made up of diagonals (the stance of the woman's figure in motion, the roof lines of the buildings in the foreground, the twist of the woman's shadow, and the diagonal lines of linear perspective). The diagonal composition gives the painting a dynamic and active quality. The artist also employs a twist on perspective. The viewer sees the painting from a bird's eye view, and thus views the top of the roofs of the barracks. Yet the perspective of the buildings fading into the distance makes it appear as if the viewer is located on ground level. Perhaps the artist's intent in tweaking the perspective was to put the viewer in the mindset of a person who is trapped with nowhere to go. It is unclear whether the woman is floating above the ground or is anchored firmly to it. It may be intentional or incomplete. Painting appears to be unfinished. Stairs are roughed out but not painted, and some barracks are not outlined -- inconsistency in amount of details shown. The painting allows the viewer to enter into the psyche of the concentration camp prisoner. She is anonymous, faceless, yet longing for a world beyond the gray barracks. She watches the dawns rise above the mountain giving her hope. The keys that she holds also symbolizes the yearning for freedom.